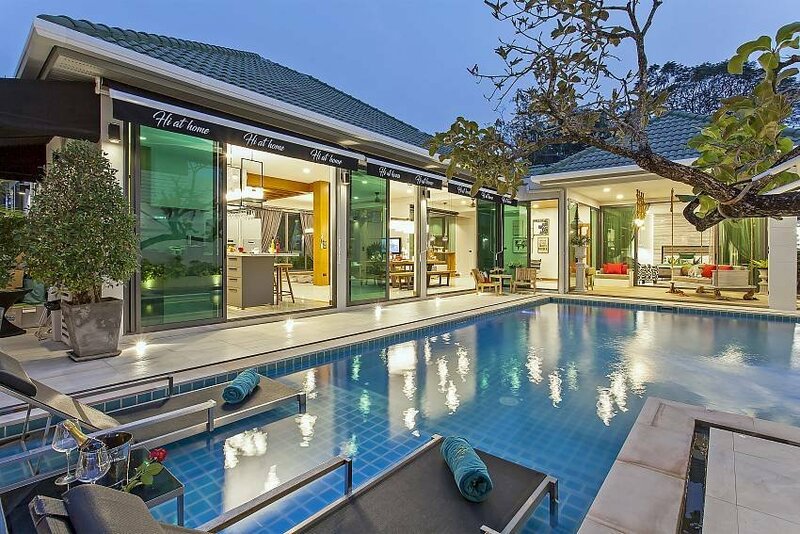 Chill & Chic Villa is nestled in a quiet East Pattaya location that is close to many of the city’s best attractions. This sizable property spreads over a single floor, making it very convenient for families with children and travelers of age. It can accommodate a maximum of 8 guests. The villa has a spectacular outdoor area where guests can enjoy themselves day and night. Cool down in the private pool with mineral water, soak up the sunshine on one of the sunbeds, or sample freshly made BBQ as you catch up with family and friends in the Sala or in one of the villa’s many cozy corners. There are 4 air-conditioned bedrooms, each with an en suite bathroom, fitted to the highest standards. Every bedroom features a king size bed, large-screen TV (additionally, the master bedroom has a DVD player and surround system), vanity table and either a wardrobe or a dressing room. The master bathroom has a skylight, double sink vanity, and a bathtub. The villa’s living area is open plan with dining and kitchen. The sleek kitchen is fully fitted for self-catering, with high-quality appliances and a breakfast bar. Free Wi-Fi and daily cleaning are included, and a number of additional services such as chef service, massage, and food delivery are available for an additional fee. The villa has a large parking space as well. The villa is within walking distance from shops and restaurants, 3 km away from Pattaya City, and 4 km away from Pattaya Beach.